You are here:Home-Domain.com-What is ICANN? You might not have heard the acronym ICANN, but it’s imperative to keeping the Internet running as we know it. 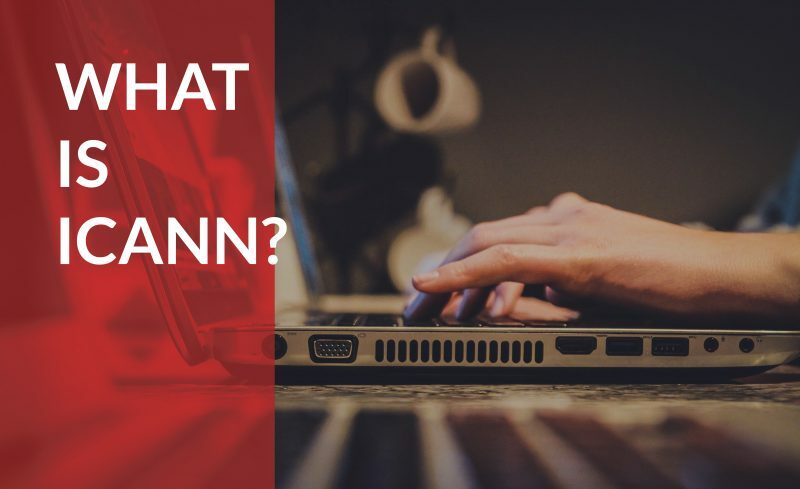 In this post, we’re going to talk about everything you need to know about ICANN, and the vital role it plays within the worldwide web. ICANN, which stands for Internet Corporation for Assigned Names and Numbers, is a non-profit organization that was established in the United States in 1998 to help maintain the security of the Internet, and allow it to be usable by all. Anytime you register a domain on the Internet, you go through a domain name registrar, who pays a small fee to ICANN to register your domain as part of the domain registration process. While ICANN doesn’t control what content goes on the Internet, meaning it cannot regulate Internet access or help to stop spam from occurring, it does help keep the web safe by developing and enforcing policy on the Internet’s unique identifiers. These unique identifiers are the name and number that you type into the address bar when conducting a search for a given site. The address for that site has to be unique so computers know where to find each other. By helping to coordinate these unique identifiers all over the world, ICANN allows us to have a global Internet. In doing so, ICANN also helps promote competition on the web and plays a vital role in the expansion and evolution of the Internet. How is ICANN related to the Domain Name System? There is a system that exists to make the Internet accessible to human beings. This system, called the Domain Name System, or DNS, makes it easier for us to remember a web address, or IP address. An IP address is a complex series of numbers that each correlate to a different device, however, it would be quite difficult for a human to remember these long lists of numbers. The DNS steps in to convert these numbers to a series of letters instead. The IP address links this series of letters to the precise series of numbers. When this conversion is done, you can find a given website with its name, rather than a seemingly random series of numbers. The computers still communicate with each other and know the address by these numbers, but for humans, we just need to remember to Domain.com, for example. The DNS, therefore makes it much easier for people to use the Internet. It also prevents a domain from being tied to one specific computer, since it is easy to change a particular domain and IP address. When a change occurs,, it takes the entire Internet less than 48 hours to recognize the change because the ultra-flexible DNS infrastructure is constantly updating. A domain is comprised of two elements, including what comes before and after the dot. What comes to the right of the dot, such as a “com,” “org,” or “net,” is what is known as a top-level domain, or TLD. For each particular TLD, there is one company, or registry, that is in charge of all domains that end with that specific TLD. This registry has access to the full list of domains that are directly under that name, in addition to any IP address with which those names are associated. The part before the dot is likely the name of your company, or organization, and is the domain name that you register. This domain is used for your website, email, and more. The DNS, therefore, makes it possible for people to find particular websites on the Internet, through the information provided during the domain name registration process. Email and many other online uses are also based upon this system. Domains are sold by registrars. There is no single registrar that rules over all domains, but rather a vast network. These registrars can charge whatever they want for a domain, but each registrar has to pay a set per-domain fee to the appropriate registry in which the domain is being registered. ICANN has contracts with each of these registries and runs an accreditation system for registrars. This system of checks and balances provides the stable domain name environment, which gives us an open Internet. What is ICANN’s role in IP addresses? The relationship between ICANN and IP addresses is similar to that of the domain names used by humans. Just as you cannot have two domains of the same name, there also cannot be identical IP addresses. ICANN does not run this system, but serves in an administrative role. It helps coordinate how IP addresses are handed out so no repetitions occur. ICANN also serves as the central repository for IP addresses. In this repository, ranges are supplied to regional registries, who then distribute them to network providers. What does ICANN have to do with root servers? There are thirteen root servers in all, meaning, more technically, that there are thirteen IP addresses where root servers can be found. These servers that have one of the thirteen IP addresses can be located in dozens of different physical areas of the web. However, all of these servers store a copy of the same file that acts as the main index of the Internet’s address books. Each top-level domain has an address listed where you can find that registry’s address book. Root servers are not consulted very frequently, since once it is known by computers on the network, the address of a top-level domain is retained. They only check back in occasionally to make sure that the address has not changed. However, root servers are still an important piece of the Internet and help to keep it functioning smoothly. The operators of the root servers are able to remain largely autonomous. However, they still need to work with each other and make sure the system stays up-to-date with ICANN and the changing Internet. What is ICANN’s primary purpose? The main role of ICANN is to make the Internet run smoothly all over the world. This is more commonly known as “universal resolvability.” This term means that you get the same results when you access the network, no matter where you are in the world. This gives us one Internet, rather than an experience that works differently depending on your location. ICANN as a whole is actually made up of several different groups, which each represent a different section of the Internet. Each group contributes to any final decisions made by ICANN. These supporting organizations of ICANN represent IP addresses, domain names, and country code top-level domains. There are also four advisory committee teams that offer ICANN advice. These advisory committee groups represent government bodies and international treaty organizations, root server operators, Internet privacy and security, and the at-large community (referring to the average Internet user). Finally, there is a technical liaison group that works with organizations to provide basic protocols for Internet technologies. All ICANN final decisions are made by its Board of Directors. The Board has 21 total members, 15 of whom have voting rights, while the remaining six are non-voting liaisons. Eight of the voting members are chosen by an independent nominating committee, while the rest are nominated by supporting organizations. ICANN also has a President and CEO, who direct the ICANN staff and its work. This staff is located all over the world in different countries and coordinates their efforts with supporting organizations and advisory committees. What is the ICANN decision-making process? Since ICANN has a pretty important job to do, you may be curious about how they go about making changes to the Internet. The supporting organizations suggest changes to the current network, or bring up any concerns that they or an advisory committee identifies. These changes are discussed, and eventually, a report is created and released for public review. When the suggested changes impact another group within the ICANN system, that group is given the opportunity to review the suggested changes and offer opinions on the matter. This group’s views are then released to the public, as well. Each of these reviews is put into a single report that is put before the ICANN Board of Directors, including a list of recommendations based on the feedback. The Board then goes over the list, and either approves or denies the changes. The Board can approve all changes, or approve some and deny others, or even perhaps deny the entire proposal. Often, the issue is sent back to one of the supporting organizations involved, with an explanation of what needs to be amended before the matter can be approved. The process repeats until every group involved, and the Board of Directors, can agree to a compromise or a final decision on the report is made. There are both external and internal accountabilities for ICANN. As far as external accountabilities are concerned, ICANN as an organization is incorporated under the law of the State of California. ICANN, therefore, must abide by United States’ law and can be taken to court by the U.S. judicial system. As a public non-profit organization, ICANN and its directors are also held legally responsible for upholding their duties under corporate law. ICANN also holds itself accountable through its bylaws, the global Board presence, an independent nominating advisory committee (which selects some Board members), senior staff who are annually elected by the Board, and dispute resolution procedures, including a Board reconsideration committee, an independent review panel, and an ombudsman. ICANN serves a primary role in the efforts to keep the Internet open for all. It does this through its model of multi-stakeholder control, although some have expressed concerns about ICANN operating as an independent body, fearing that no single business, government, or individual should be in control of the Internet. It should be stated once more that ICANN’s role is not to regulate content that appears online, however, there are concerns about the content that may emerge when the DNS is controlled by international governments. There are additional concerns over how ICANN handles controversial content, and other matters, since domain-level takedowns could be viewed as violations of freedom of speech and/or freedom of the press. The processes ICANN has incorporated serve to ensure that the Internet remains open to all users, all over the world, on one connected network. As you can see, ICANN plays a pivotal role in maintaining the Internet as we know it and continues to mold and evolve the Internet of tomorrow. Anytime you register a domain, ICANN gets a small piece of the fee, and oversees your domain to help maintain the security of the web.